For the new issue of the children's history magazine GEOlino Zeitreise I drew a new comic about the adventures of Lina and Tom – two children from the year 2064 that travel through time and space. This time they go to the year 1868 and help Heinrich Schliemann rediscover Troy. 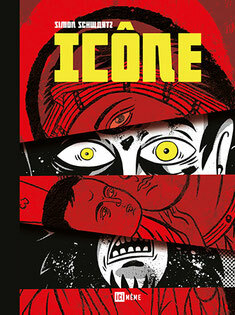 This august my new french publisher Ici Même, released my latest book Icône in France. The book looks amazing and has a fine translation by Mathilde Ramadier. "Gleb Botkine, fils du médecin personnel de Nicolas II de Russie, est épris depuis l’enfance d’Anastasia, la fille du tsar, avec laquelle il a grandi. Son destin bascule quand la famille impériale est massacrée à la suite de la révolution d’Octobre.Mais qui est cette jeune femme qui, des années plus tard, se prétend rescapée de la tuerie, et en laquelle Gleb reconnaît, comme tant d’autres, la descendante de la maison Romanov ?Puisant dans l’histoire politique et religieuse de la Russie, Simon Schwartz mêle à l’histoire vraie d’Anastasia Nikolaïevna une réflexion sur l’image et son pouvoir." For the new issue of the children's history magazine GEOlino Zeitreise I drew a new comic about the adventures of Lina and Tom – two children from the year 2064 that travel through time and space. This time they go to the year 1773 and take part in the legendary Boston Tea Party. 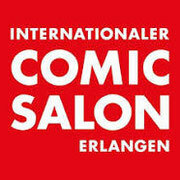 Festival: "Internationaler Comic Salon Erlangen 2018"
From may 31 to june 2 I will be at the "Internationaler Comic-Salon Erlangen 2018" and sign my graphic-novels at the booth of the avant-verlag (hall A; booth 51). On may 31 at 5:30 p.m. and on june 2 at 4 p.m. 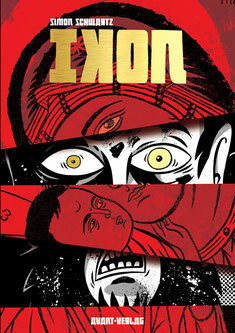 I will read from my new graphic novel IKON. On you june 2 you can also bid an original drawing of mine as part of the comic auction. You can find more informations right here. I'm very exited to meet some of my readers at the festival! 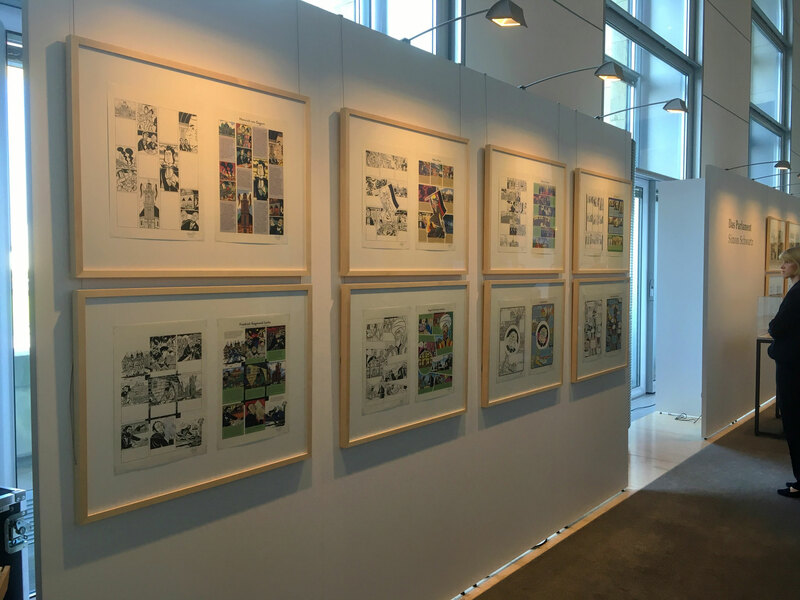 I am absolutely thrilled and honored to announce that the prestigious Angermuseum in my birth town Erfurt will show a big retrospective of my work of the last 15 years named "GESCHICHTSBILDER – Comics & Graphic Novels". From May 18, 2018 till September 9, 2018 you can see original artwork from all my graphic novel and even some rarities like my early work for "Mosaik" and some never before seen Illustrations, Comics and Artprints. 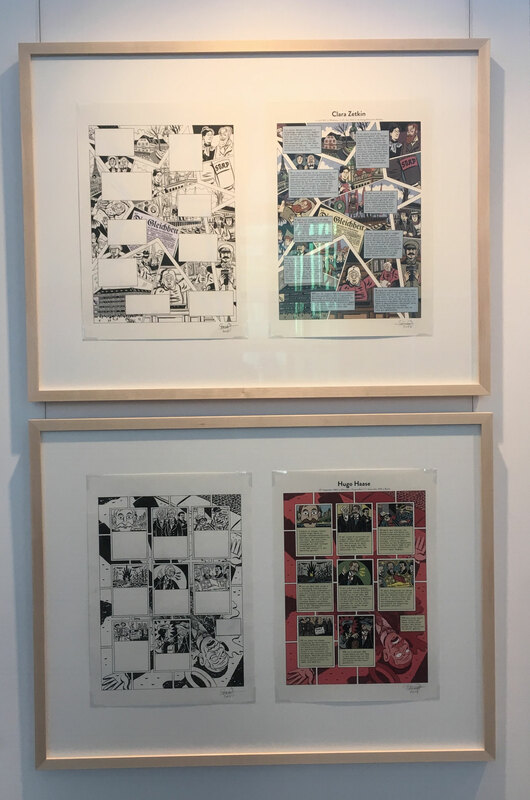 The exhibition will be accompanied by a big art catalog with many pictures and articles by Andreas Platthaus, Dr. Christine Vogt and Dr. Jochen Voit. 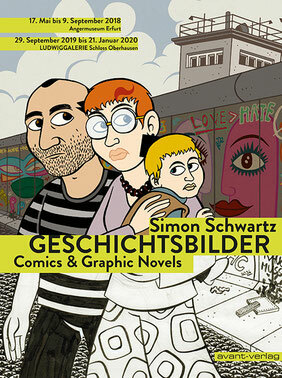 After almost six years of work I'm more than happy to announce that my german publisher avant-verlag just released my new Graphic Novel IKON. The book tells the almost unbelievable but true story of Gleb Botkin – the son of the last tsar's physician. "IKON folgt dem Russen Gleb Botkin, der als Sohn des Leibarztes des russischen Zaren die Oktoberrevolution miterlebt und dabei seine engste Vertraute verliert – die Zarentochter Anastasia. Jahre später, im amerikanischen Exil, trifft der spirituell entwurzelte Ikonenmaler Botkin eine psychisch kranke Frau, die vorgibt, seine verlorene Anastasia zu sein und Anspruch auf den russischen Thron erhebt. Botkin, der sein ganzes Seelenheil auf diese tragische Gestalt projiziert, verliert erneut den Halt und verschreibt sich mit Leib und Seele seiner wiedergefundenen Ikone. Ikon ist eine – auf wahren Begebenheiten basierende – Erzählung über Verlust, Projektion und die Liebe zweier verlorener Seelen, die von der Brutalität des 20. Jahrhunderts gezeichnet wurden." The book is available as a softcover and also as a limited hardcover edition with a signed artprint. For the new issue of the children's history magazine GEOlino Zeitreise I drew a new comic about the adventures of Lina and Tom – two children from the year 2064 that travel through time and space. 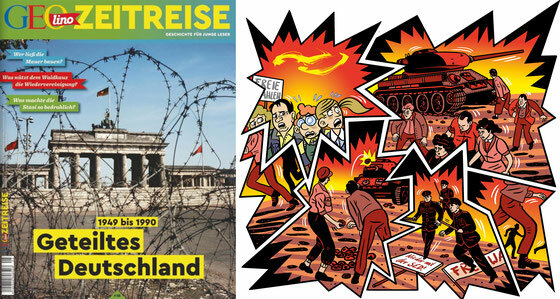 This time they travel to East Berlin and witness the people's uprising on june 17, 1953 against the East German government. 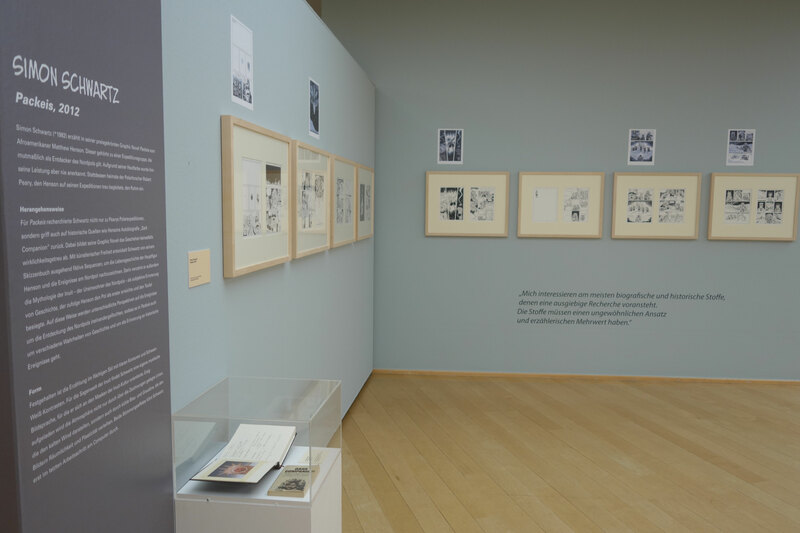 From February 3, 2018 till May 6, 2018 you can see original artwork from my graphic novel Packeis at the Horst-Janssen-Museum in Oldenburg as part of the exhibition "Die Neunte Kunst - Aktuelle deutsche Graphic Novels". The exhibition shows some of germanys best know modern comic artists including Anke Feuchtenberger, Anna Haifisch, Barbara Yelin, Birgit Weyhe, Felix Pestemer, Hans Hillmann, Isabel Kreitz, Jakob Hinrichs, Lukas Jüliger, Max Baitinger, Olivier Kugler, Reinhard Kleist, Ulli Lust and myself. 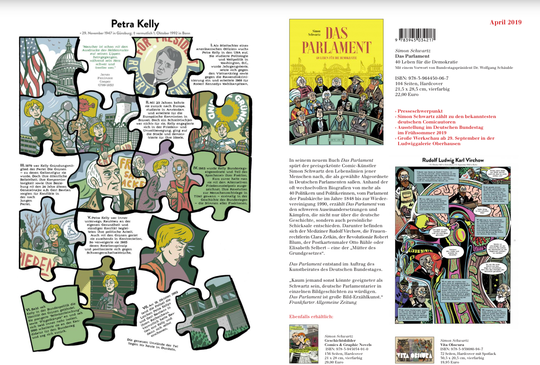 I am very happy to announce, that my exhibition „Das Parlament“ at the at the german parliament the Bundestag has been extended until January 21, 2018. 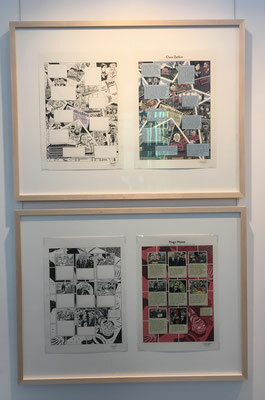 The exhibition shows 20 comic biographies about german politicians from the Frankfurt Parliament in 1848 up to the seizure of control by the Nazis in 1933. The project is a contract labor for the art council of the german parliament. A second part about german politicians from 1933 till 1990 and a book are in preparation. You can also download the official flyer right here.